- Great graphics, sound, presentation. - HUD view works well and was my favorite view to play from. - Assistant Mode Off takes a bit getting use to. It becomes more critical later on when dog fighting aces but I wish it didn't force you into the totally retarded and awkward 3rd person "action" cam. I would have prefer the "turn on a dime" maneuverability while keeping me in HUD view. You'll eventually come to grips with it and become effective but never quite comfortable with it. - We finished the entire campaign with 3 player co-op (it supports up to 4). It makes things a bit easier since as long as one of you stays alive the other players will respawn after 15 sec or so. Co-op is a blast and is definitely highly recommended you experience the campaign that way if you can. 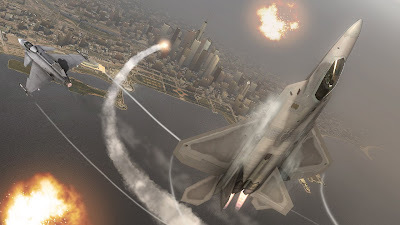 - Mission design was pretty good with only a couple of frustrating ones. The story is forgettable and the ending is rather abrupt. - There is a bug where you don't always get your achievements. This happened to me on the last 3-4 missions. So even though I finished it all on the hardest difficulty level I didn't get my achievements. Ubisoft you hear me! You owe me my achievements! Replaying the missions didn't help. Overall I enjoyed the game quite a bit until the achievement bug and now the game is dead to me. DEAD TO ME!!!! Still, it's worth picking up if you can find it for cheap say around the $20-30 range.